We measured a selection of these jackets and also tried them on our Fit Check mannequins Huey and Dewey to see how they fit. Normally we’d put Huey in a Medium/42 US (52 Euro) and Dewey in a XL/46 US (56 Euro) but this model runs just a touch smaller than most Euro sized jackets. In our photo gallery, Huey is wearing a Euro 54 and Dewey is in a 58 which both look great. This product is sold in European sizes. Generally speaking, the US chest size in inches is equivalent to roughly 10 points less than the European jacket size. Example: a 56 Euro jacket is similar to a size 46/XL men’s US size. But since this jacket style runs a bit more snugly, we recommend buying one size larger, add about 11 points to your US chest size to get the right Euro size. I’d suggest you measure yourself with a tape and get your chest size and belly size, then use the size chart to pick the smallest size jacket that will be big enough for both your chest and belly using the chart below. Approximate US alpha sizes are also listed in the chart so you can check if the jacket size you choose is the same alpha size as you normally wear in men’s clothing. I’d call the overall cut of this jacket “sport casual”. It is meant to fit snug, but it doesn’t taper nearly as much as sport/race jackets. The difference between the max chest and max belly is about 2”-3”. With sport/race jackets the “drop” from chest to waist will be more like 4” to 8” depending on the model. The overall fit if this style is much more forgiving and will fit a wider range of body types. 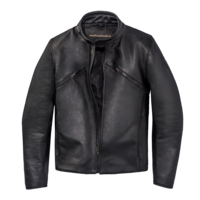 The Dainese Prima 72 jacket is another style in their limited edition Settantadue collection of jackets. We acquired a group of jackets in this group which includes the Freccia 72, Nera 72 and Toga 72. All the styles have a similar fit and all offer classic styling along with modern protection. the Prima 72 is the most “mature” style of the group. It comes with Dainese Pro-Armor in the shoulders and elbows and a compartment for a back pad which is optional. I mentioned this jacket is the most “mature”. I get that overall impression because of the sedate styling and the use leather with a softer feel and a more matte finish. The leather feels plenty thick.. probably more thick than the other Settantadue styles, but its softer and will require less break-in. The finish is matte and shows more grain. The only obvious branding on the sleeve is a small demon logo on the left shoulder. The inside lining is a nylon mesh and the sleeves are lined with slick nylon material, which I really like. The slick finish of the sleeve lining lets you slip your arms in without pulling up your shirt sleeve. On the front chest area, you’ll see two zip close pockets. These serve a dual purpose. Behind those zippers are panels of perforated leather which will allow air to flow through to help you in warmer weather. And below the perforated leather panel is a large pocket. So you can use this feature for storage and or venting (but maybe not both, ha). The armor included for the shoulders and elbows is their new Pro-Armor type which is the honeycomb molded rubber you see from many premium brands. It is highly rated and is also soft and lighter than armor made of solid compounds. The back protector I’d recommend for this jacket is the Pro-Armor G back protector. Take the link below to order. It is a similar honeycomb design and will work great in a style like this. Dainese says: Before Dainese, motorcycle leathers were black, unlined and far from ergonomic. Back then we consigned them to history. But now we’re bringing them back with improved ergonomics and a whole new level of attention to detail. This ingenious design has chest pockets that conceal perforated leather inserts, plus an advanced technical lining for effective ventilation in even the hottest weather. Nature grain leather adds a unique timeless feel. While Pro-Armor protection keeps you safe and comfortable on even the longest trips. Presenting Prima72. Cool in more than looks.